But ................... (there always has to be a but!). Today is my wedding anniversary. My WH and I have been married for 5 years now and boy have they flown by. In between study and assignments, my WH took me out to a beautiful dinner last night. The celebrations don’t stop there though! Yesterday was Baby Matthew’s first birthday! Where has that year gone? And yes, you can read between the lines – last year I spent our wedding anniversary in hospital with a new born baby! Baby Matthew is not really a baby any more. He’s crawling like crazy and talking the sweetest baby babble ever! 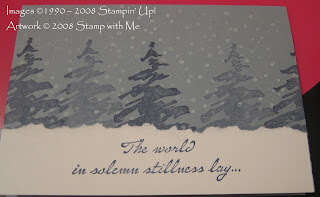 As time is not in my favour today, I can only show you my card for this week’s Christmas Countdown which relates to using the Solemn Stillness stamp set from Stampin’ Up! for a beautiful but really fast card. Have a go!